Democratic presidential candidate Hillary Clinton speaks to a crowd of supporters in Des Moines after finishing behind Barack Obama in the Iowa caucuses. A Second-Place 'Victory' for Edwards? There's a problem with running on the idea that you are inevitable: it leaves little room for a stumble. And in an unprecedented political season in which primaries are stacked up like planes over LaGuardia, there's little time to recover. The debate Thursday night inside Hillary Clinton's shell-shocked campaign was what to do now  specifically: how negative to go on Barack Obama. 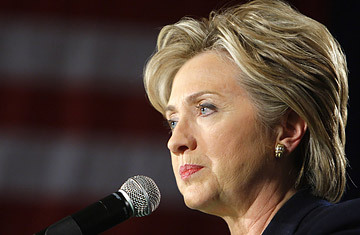 Her 10-minute speech from the stage in the Hotel Fort Des Moines was all magnanimity and grace. Congratulating Obama and former North Carolina Senator John Edwards, who finished ahead of her, Clinton said, "Together we have presented a case for change and made it absolutely clear that America needs a new beginning." But with her husband the ex-President by her side, and an array of former Clinton Administration officials around her, Clinton was the center of a backward-looking tableau  a bridge to the 20th century, as it were. That only underscored the challenge of presenting herself as a candidate of change, which, if the admittedly impressionistic Iowa exit poll results are to be believed, is the transcendent dynamic driving Democratic voters. So it would appear Clinton has little choice but to try to create a new dynamic. Behind the scenes, her strategists have already begun to figure out how much heat to put on the sudden front-runner, whose win was far more decisive than just about anyone had expected. Until now, Clinton's campaign has been relatively restrained in what political pros euphemistically call "contrast"  in large part, because Iowans have a history of rejecting negative campaigning. (See: Romney, Mitt.) "We certainly held back," one Clinton aide said. But all that may be about to change. "We've got to start holding him to the standard people hold her to," Clinton's chief strategist Mark Penn told reporters aboard the campaign's chartered jet to New Hampshire. "I think there's a basic choice between experienced leadership for change and inexperienced leadership that talks about change." Added another adviser: "You're going to see some very sharp media now." That suggests the next round of Clinton ads will go beyond the previous gentle references to Obama's lack of experience and begin to look at, for instance, inconsistency in his voting record. They are looking at issues like gun control, where he previously took a harder stand that may not play well with gun-loving voters in New Hampshire, and health care, where he previously expressed support for a government-run health care system. Clinton plans to exploit every whiff of inconsistency. Of course the contest has only just begun  something the campaign was quick to emphasize. "It's been a hard-fought race here in Iowa for the last year and all eyes now turn to New Hampshire," campaign manager Patti Solis Doyle said in a statement issued shortly before Clinton took the stage. "This race begins tonight and ends when Democrats throughout America have their say. Our campaign was built for a marathon and we have the resources to run a national race in the weeks ahead." Privately, campaign officials were realistic about what lies ahead: a big momentum boost for Obama, and certainly, an avalanche of campaign cash. (A win by former North Carolina Senator John Edwards would have done far less damage, because he lacks the financial resources and organization to go forward.) If there was any consolation, it was that former Arkansas Governor Mike Huckabee's big win guarantees a spirited race on the G.O.P. side, and New Hampshire independents, who have a choice of participating in either party's primary, might lean towards voting with the G.O.P. Polling has indicated, however, that unaffiliated voters in New Hampshire are far more interested in the Democratic race. It is undeniably interesting  but for a candidate who once hoped to make it inevitable, interesting is a very bad thing.